Running somewhat conservatively, saving energy to lead off his team in Saturday’s 2nd Tortola Torture, Reuben Stoby led the field of 33 participants during the first of two Dive BVI 10K Series races over the weekend, which are a tune up for the 5th Virgin Gorda Half Marathon and 6 Mile Challenge on May 14. Stoby ran the race over the first half of the Half Marathon course with a trek out to Nail Bay and a climb over the notorious ‘beast’ in 46 minutes and 14 seconds. Maria Mays was timed in 51.16 in the women’s division. Saturday’s race came ahead of the upcoming early bird preregistration period that end on Friday. McNutt said the early bird cut off is where participants can register for $60 before the fee goes up to $70 from April 16. The $40 fee for the 6 Miles Challenge will increase to $50. Final results. Men: 1. Reuben Stoby, 46:14. 2. Julius Farley, 48:51. 3. Curwin Andrews, 50:56. 4. Vincent Fournier, 51:50. 5. Alan Cundall, 53:56. 6. Ben Mays, 57:19. 7. 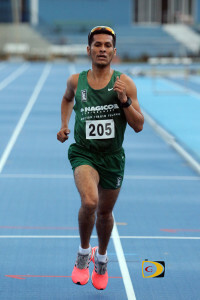 Dennis Versoza. 1:07:25, 8. Ryan Everett, 1:08:57. 9. Luke Plummer, 1:09:44. 10. Paul Hubbard, 1:17:47. 11. Zebalon McLean, 1:22:33. 12. Tim Backlund, 1:25:24. 13. John Hudspeth, 1:34:19. Women: 1. Maria Mays, 51:16. 2. Rosmond Johnson, 57:59. 3. Kat Brownsdon, 1:01:11. 4. Anna Gillham, 1:01:44. 5. Kay Reddy, 1:03:15. 6. Becca Knight, 1:06:19. 7. Kim Takeuchi, 1:10:18. 8. Debbie Bell, 1:10:33. 9. Sarina Hancock, 1:12:59. 10. Tiffanie Houston, 1:17:36. 11. Jude Holmes, 1:17:47. 12. Clair Burke, 1:19:01. 13. Nedy Adordionicio, 1:20:45. 14. Michelle Backlund, 1:25:25. 15. Casey McNutt, 1:33:36. 16. Tasia Veenkemp, 1:33:37. 17. Kim Hudspeth, 1:34:19. 18. Kim Beradine, 1:44:58. 19. Chrissann Nickel, 1:44:59. 20. Chris Yates, 1:49:20.